The Medina L shaped reversible reception desk combines modern style with function. 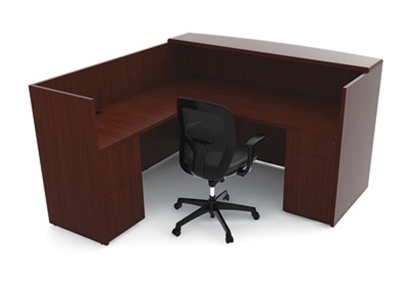 This desk is constructed with a 1" thick laminate work surface and is detailed with a distinct beveled edge. Style meets function with this affordable double reception unit from OFM. Easy assembly, no tools required and 4 beautiful finishes! 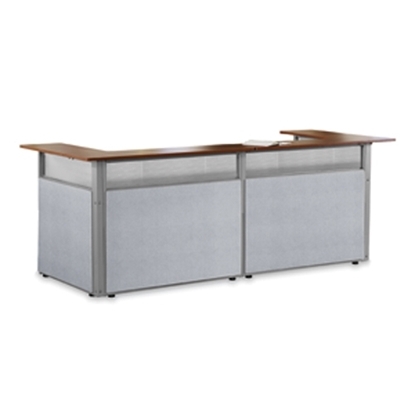 A perfect reception station for one or two users, this reception desk features a durable steel base and frame and is available in two panel colors and two laminate top finishes. The Office Star Sonoma L shaped reception desk with wood veneer features a multi-radius wood veneer design beautiful in any office environment. Perfect for an executive office or waiting room. Free shipping and warranty available on all discount reception desks. The Mira is a 72" wood veneer reception desk that features simple curves, creating an elegant setting for any work environment. This model from Mayline features a 1 1/2" thick hardwood edge. Available in Medium Cherry or Espresso finish to match your office decor. Warranty and free shipping on all discount furniture collections. Napoli wood veneer reception desks provide a terrific first impression to your office, while offering the privacy and storage you need. The stylish curved wood surfaces, frosted glass counter, and silver accents add a real touch of elegance to your office. Free shipping and warranty available on all discount furniture collections. The Office Star Kenwood L shaped reception desk features genuine wood veneer, fluted edge styling and elegant metal pulls for a beautiful compliment to any office environment. Perfect for medical waiting room or guest reception area. Free shipping and warranty available on all discount reception furniture. The Mayline Mira L shaped reception desk with wood veneer features simple curves that create an elegant setting for any work environment. 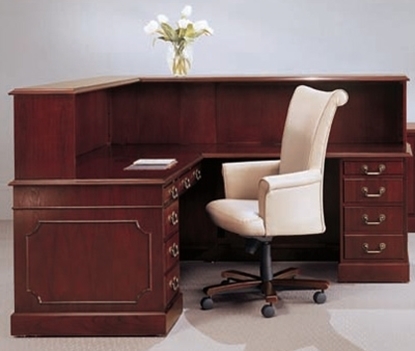 This desk from our large collection of office furniture features a 1 1/2" thick hardwood edge. 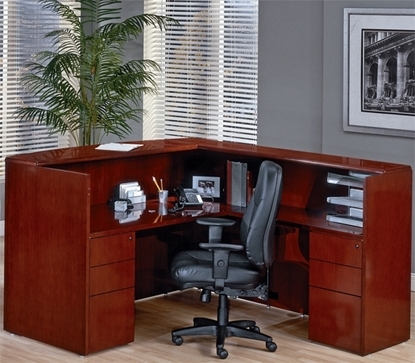 Free shipping and warranty available on all discount office desks. A wood veneer reception desk with two pedestals for all you storage needs. 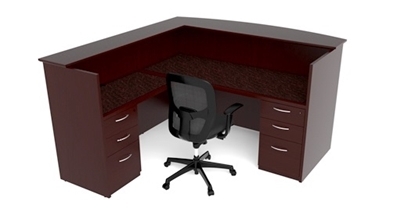 This desk features a 1 1/8" thick work surface and is available in two stylish colors. A reception station with rounded counter and three distinct work areas, the Marque 55293 by OFM provides ample work space for employees and office visitors alike. Optimize your waiting room, reception area, or lobby with this functional and contemporary triple-unit desk without compromising your budget. This three person welcome station features convenient wire management cutouts, as well as durable construction marked by a powder-coated painted steel frame, and thermo fused melamine finished with self edge. The Marque reception desk is available in 4 finishes (Cherry, Maple, White, or Walnut) and requires no tools for assembly. Free shipping on every order! 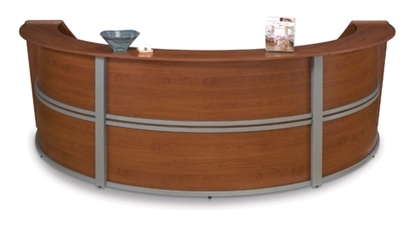 This Mayline Napoli L shaped reception desk with wood veneer offers style at an affordable price. With it's Italian influenced design and hand-crafted AA-grade North American select wood veneers using a 14-step finishing process to insure uncompromised quality and consistent beauty. Perfect for a medical, legal or business waiting room area. Free shipping and warranty available. This Sorrento reception desk will impress even the most critical of guests. The multi-species hardwood veneers and marble counters speak to the quality craftsmanship found throughout. 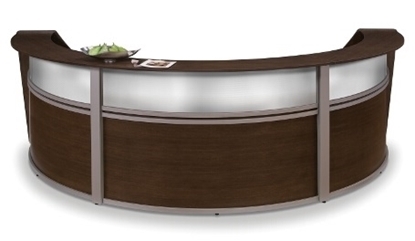 Your reception area would look stunning with this OFM reception station! Four beautiful finishes, plexi panel and no tools needed for assembly. 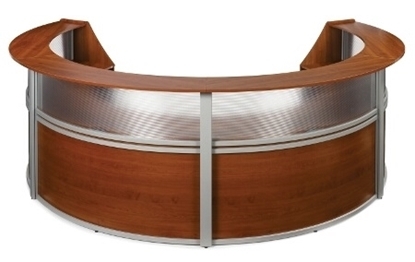 A traditional style wood veneer L Shaped Reception Desk from JSI. The Brogan series features decorative molding, cherry or hand-rubbed walnut work surfaces, polished brass hardware, and ball bearing drawer suspensions. 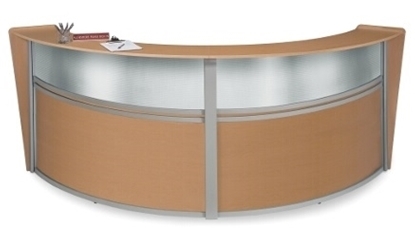 This reception desk has high sides for privacy, a convenient transaction top for signing papers and has a left-handed L-return. Warranty and free shipping on all furniture collections. Mayline SRCSLM Left-Handed L-Shaped Reception Desk with Ample Workspace 72"
The Sorrento L Shaped Reception Desk will impress even the most critical of guests. This high quality wood veneer desk features a marble transaction top, plenty of storage, a generous worksurface area, and the privacy you desire. Features a left hand configuration and 72" wide work surface. Perfect for a business, legal or medical office. Warranty and free shipping available. Mayline SRCSRM Right-Handed L-Shaped Reception Desk with Marble Top 72"
This Sorrento L Shaped Desk has a right hand configuration. Impressive is a good way to describe this model. It features a marble transaction top, 72" wide work surface, and plenty of storage space. Perfect for a medical, legal or business office waiting room. Free shipping and warranty available. Want a high-end designer look at an affordable price in your reception area? The Marque Series from OFM features a top plexi panel to allow light into desk area, wire management cutouts in interior and no tools required for assembly!